Best View in Brooklyn: Going Up? Choosing Uglier and Bigger. Going Up? Choosing Uglier and Bigger. The story of 772 44th Street is one we've seen all too often around here. Let's not pretty up the fact that the building that was here had very little appeal, but the new owners chose to create the new building, and it's much more building than we had before. The building you see above was a two-family; the building that's shaping up below will be nothing less than a four-family. They are working on the fifth floor now, but it looks like it's only supposed to be four floors. Please do correct me if I'm wrong about that. Aesthetic concerns are one thing, but something that rankles even more is that changing a two family into a four (or five) family does more than offend the visual senses. Adding people to an infrastructure (water, sewage, sanitation, schools, and so on) that is not making much progress where improvements are concerned is troubling in many more ways. It's something we're seeing a lot of throughout our fair borough. Consider learning more about the proposed re-zoning of Sunset Park. According to Dept of Buildings filing records, it looks like it's going to be a 4 story building with a cellar. A commerical space with 3 residental units. I suppose if the walled balcony will be commercial, and the ground floor counts as cellar, that would work. Thanks. Pls note that the property/inhabitants to the left (stage-right)of the construction site is/are not properly protected. If 1 of the bags on the top balcony falls eastbound from the top floor balcony someone could easily get killed. Pls call the Dept. of Buildins and report an unsafe condition at this site. I did. 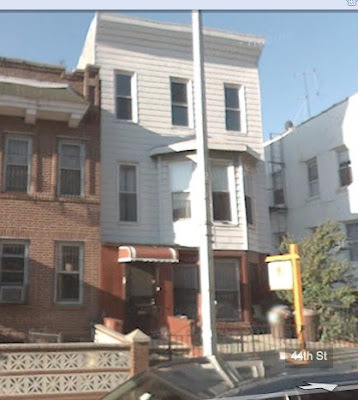 This is no 4-story building; this a 5-story structure that the owners hope will be grandfathered and allowed to remain after they negotiate some ridiculously-low fine (see 472 42nd Street). These situations are beyond the re-zoning issue, though, I agree, we must all come out, en masse, for the hearings. This over-building is also very much a problem at the Dept. of Buildings; someone(s) has friends inside the Dept. that look the other way when permits/law are violated. Thank you for calling, and for letting me know I'm not the only one who saw this was an illegal building growing out of the former structure. I am definitely attending the hearing at OLPH on the 16th. When we rented our apartment on a sidestreet off 8th avenue, next to a small church, we had no idea that the residential looking building across from us would unveil a 24 hour seafood restaurant at the street level. Is this legal? I'm not looking forward to a summer of smelly garbage, loud voices at night, and whatever else a 24 hour restaurant off the avenue can bring. I'm also a little taken aback by so much of the crowding and congestion in my neck of the woods. It took a couple months of living here and counting three or even four Con-Ed meters on the outside of two-family houses to understand where this crowding originates. We didn't buy our apartment, but I'd like to put down roots in Sunset Park, and although I understand that this is no longer my grandmother's Brooklyn, there must be limits to keep Brooklyn a residential, mellow place to live. Sure ugly is ugly, but I for one have no issue with five, ten, and bigger story buildings. I don't want to see beautiful buildings torn down to make way for big ugly condos. But tearing down an eye sore and replacing it with a new building? Sounds great to me! I'm concerned about the price tags and gentrification that comes with condos. But as long as the real issues are controlled I personally look forward to a day when Sunset sees towering buildings. As I mentioned in the post, the current infrastructure can't support the huge numbers of people the development wants. Not only that, but these quickie types of buildings are irresponsible in their building practices as well. Granted, if we want affordable housing, large buildings are necessary. However, other services need to be raised along with huge buildings. Those new McCondos are not what I'd call neighborhood enhancement. I see those buildings and inwardly groan, here comes more traffic, more garbage, more congestion, more people fighting to get onto the subway. Our neighborhood just wasn't designed for this population explosion, and there should be limits. I do NOT look forward to a day when Sunset sees towering buildings. 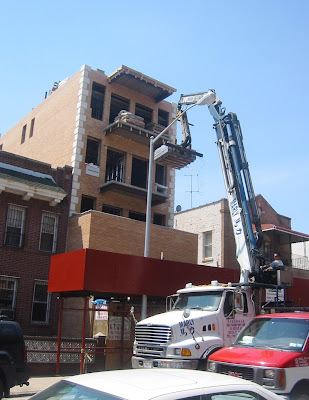 We are NOT downtown Brooklyn, we are a residential neighborhood with a row house character. If you want towering buildings, then live in Murray Hill. I am the youngest son in the last family that lived at 772-44th. We called it home for almost 50 years. It never was a lovely house, but it was the first house on the block and it was wooden frame construction. Progress is what it is, I only lament that there are no guidelines for the aesthetics of the neighborhood. there are so many wonderful alternatives to blond brick boxes that look more at home in another continent. on 54th street btwn 8th and 9th ave, they torn down my 3 family home and built a 5 story building which houses a restaurant and "condos". There's 2 of those buildings and another "condo" building of 7 floors down the block which was built in place of a 1 family home.